Insurancewith.com, the specialist travel insurance broker for those suffering from cancer and genetic diseases, sponsored leading cancer charity Fighting All Cancer Together (FACT’s) first major awareness day at Newcastle’s Metro Centre. The event, which took place on 2 October, was the first time FACT had brought together under one roof over 40 support services available to cancer patients and their families, from holistic therapists to specialist underwear supplies. 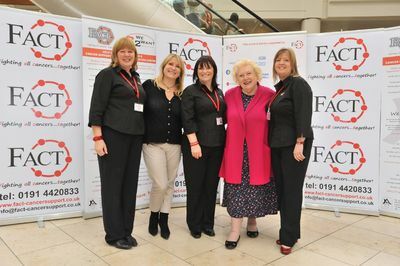 Supporters and cancer sufferers were greeted at the event by TV agony aunt and FACT patron Denise Robertson. Local government councillors, civic dignitaries and local TV personalities also joined her on the day. Insurancewith.com operations director Fiona Macrae said: “I am really delighted to be supporting FACT to achieve its goal of raising cancer awareness. FACT is one of many charities we are supporting through the sales of our policies. FACT chair of trustees Joanne Smith said: “We really appreciate Insurancewith.com and Fiona’s invaluable support. This event will be another 'first' in cancer awareness for this region it's never been done in such a huge shopping centre before. “The event brought together services available to cancer patients and their families, as well as addressing education and prevention issues. It also gave those suffering from cancer and their friends and families the opportunity to meet others in similar positions to themselves,” she added.